She already regrets saving this fennec. 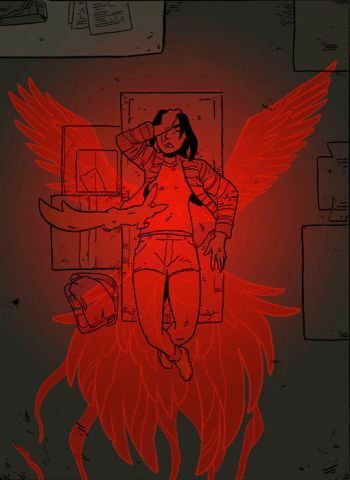 Godslave is an Urban Fantasy webcomic about modern-day Egyptian Mythology. It's the holidays and Edith doesn't feel like doing anything in particular. On her friend and flatmate's insistence, however, she decides to take a trip to the local history museum and is somewhat enjoying herself when she collides with a strange man carrying a canopic jar. Crushed in Edith's hands, the jar is revealed to have a fennec fox inside. Oddly enough, given its place of being, the fennec is alive, and the strange man is very unhappy with the fact that it has been freed. Comic updates Mondays and Thursdays. You can start reading it here . Action Girl: Edith becomes one after she discovers her new powers, even charging a Blacksmith head-on. Adorkable: It's hard to dislike Edith's boss at the restaurant. He's joking, ever-smiling and genuinely saddened when he has to lay her off. Affably Evil: Turner tries to be this when he searches the museum for Edith. Given how he tried to murder her twice at this point, it's not very effective. Affectionate Nickname: People tend to call Edith Eddy and her boss calls her his 'bombae'. Ambiguously Brown: Edith has dark skin, but she's clearly not black - compare her with girl Blacksmith. Ba - for human, their personality; for god, the embodiment of power. High-level gods have nine ba. Badass in a Nice Suit: Turner has a really nice suit. Subverted somewhat in that he ditches it when the fighting starts, to have free use of his powers. Battle in the Rain: Played with - it's raining heavily when Edith and Turner are fighting, but as they fight inside, not a drop of water falls on them. Bavarian Fire Drill: Villainous example - before going after Edith and "Anpu", Turner fakes a fire alarm to empty the museum so that he can fight freely. Big "WHAT?! ": The museum guide's reaction to seeing a live fennec inside a centuries-old canopic jar. Big, Screwed-Up Family: How "Anpu" characterizes his pantheon, the Ennead/Pesedjet, and Sobek seems to agree. "Anpu": There is one thing you should know about my family. (beat) They're all awful. Sobek: The only thing that family ever agreed on was [the jar that trapped "Anpu"]! Black Eyes of Evil: Set has solid-black eyes, emphasizing his supposed nature as an evil god of chaos. As with Edith, his irises also turn red when he's angry, giving him Black Eyes of Crazy. Blade Below the Shoulder: The second Blacksmith Edith fights, Chen, uses his powers to fight her blade-to-blade. Blood Knight: As observed by "Anpu" and Alma, Edith is good at and enjoys fighting. This makes a natural choice for the receptacle of one of Egypt's gods of war. Bond Creatures: "Anpu" inserts his ba into Edith so that she can defeat Turner and refuses to take it out afterwards. Bring It: Even after Turner tossing her several times across the room like a rag doll, Edith still has fight in her to taunt him and call "come on then!". Brought Down to Normal: What "Anpu"'s family did to him, stripping him of his ba until he's little more than a talking fennec. Change the Uncomfortable Subject: When "Anpu" starts to stray too close to the real reason of why Sobek is helping Heru, Sobek quickly changes the subject. Chronic Hero Syndrome: Edith doesn't hesitate for a second in helping a fennec she's only just seen escape from the Blacksmith even before she knows that one's a god and the other a shapeshifter out to kill him. Come Out, Come Out, Wherever You Are: In the museum, Edith and Turner play this for a moment, although the Blacksmith tries to be polite about it. Conveniently Unverifiable Cover Story: Edith — who knows almost nothing about Egyptian mythology — wrongly guesses that Set is Anpu/Anubis, which he decides to roll with — both because he wasn't sure he could trust her and to afford her clemency in case she was captured. The Blacksmiths and Heru assume she knows who she's working for and thus don't bother to just calmly explain to her why "Anpu" is such a bad guy. Cool Sword: Edith's khopesh turns out to be an excellent weapon against Blacksmiths and she obviously considers it cool too, as she carries it with her everywhere. Cryptic Conversation: Oziris and Heru (Horus) have one at the start of chapter 2, with Oziris commenting ominously that he wonders how long Heru would be "content", indicating that he knows what's hapenning. Cutting Corners: Edith's boss at the restaurant regrets it, but he has to lay her off after holidays because after summer the number of clients sank and he can't afford to hire more people than absolutely necessary. Edith can be very sarcastic when she wants to be. The girl Blacksmith when her colleague, Chen, is concerned. The girl: (flat monotone): Oh no. Don't. Chen himself is no worse. Chen:: Tch-what's this blade made of? Death Glare: "Anpu" gives Turner one when Heru's servant tries to take him. Desperate Object Catch: Edith dives to catch the canopic jar when she and Turner collide. She succeeds, but it breaks anyway. Did You Just Flip Off Cthulhu? : After Edith saves Set from being sealed by Heru and Thoth, Alma scolds the Egyptian god of storms, deserts, battle, and chaos like he's a puppy who made a mess on the carpet — much to his annoyance. Don't Fear the Reaper: Anpu - the reaper in question - encourages this heartily, claiming that his job is a necessary part of the universe. Dramatic Thunder: Lightning strikes just as Anpu's prison breaks. His second ba creates a storm and teleports Edith using a bolt of lightning. Dream Walker: Set pulls Edith into his memories of killing Ausir as she sleeps in order to show her his true self. Enemy Rising Behind: Turner does this to Edith after she unwisely turns her back on him. Entertainingly Wrong: Edith has little-to-no knowledge of Egyptian mythology and wrongly assumes the crimson fox-like creature she rescued from the museum is Anpu, better known as Anubis, when his true identity is Set. He does not correct her on this, but he does not hide that he is a god of storms and war. Sobek — who is very amused by her assumption — does not bother to correct her either. Unfortunately for Edith, Heru and his Blacksmiths assume she knows who she's working for and thus go out of their way to try to kill her, only relenting when they discover she's been tricked. Edith is not amused to discover that "Anpu" lied to her, and lashes out at Sobek over not telling her the truth. Eternal Recurrence: The universe's existence depends on the gods of Egypt dying and being reborn every so often, the process which Anpu is supposed to be in charge of. Set claims his problems started when the other gods refused to take part in it any longer. Evil Is Petty: After she regains the second ba, the Blacksmiths take Edith's backpack — which was left at the scene of the fight — and make her fight them to get back the objects she had inside it. When she regains her mobile phone, she finds out they not only changed the password to her Instagram account but posted selfies of themselves on it. Eye Scream: Edith takes down her first Blacksmith by piercing his Heru-eye. Eyes Do Not Belong There: Turner and the other blacksmiths have another eye on his neck, albeit its function seems to be communicating with Heru rather than seeing. Fetch Quest: "Anpu" gives one to Edith when he sends her after his ba. Finger-Tenting: Turner's boss, Heru — aka Horus — does this when he considers "Anpu" escaping and Edith showing up in his equation. Fish out of Temporal Water: Downplayed with "Anpu", but he's quite surprised that people would use Greek instead of Egyptian names for his pantheon and freaks out at the sight of water running from the tap. Edith's smartphone seems to fascinate him, too. Fool for Love: Implied to somehow be the reason of why Sobek is helping Heru. "Anpu": What happened to you? You've always been close with Asir's family, but this? If I had to guess... it had to with a woman. Forced Sleep: The spell Turner uses on the museum guide to maintain the masquerade puts him to sleep. Before "Anpu" is introduced, focus is briefly put on a mural depicting Anubis and Set in the museum. If you know what ba looks like, you can guess what Anpu does to Edith before he tells her. It's eventually revealed that Anpu is, in fact, Set — which is obvious to everyone except Edith and Alma, who know nothing about Egyptian mythology. This was made evident due to the red glow of his magic, his ambiguous shape resembling a fennec fox, the fact that his tail is often two-prongednote a characteristic of Set's Animal, Heru's animosity towards him, the title of the first chapter being "An Evil Day", the very first panel showing a carving of Set fighting Apep, and of course the image of Set's Animal that adorns the comic's banner. Given one of the blacksmiths refers to him as a storm god and his second ba creates a storm and teleports Edith using a bolt of lightning, it's official; and is later explicitly spelled out to Edith by Heru. Free Sample Plot Coupon: The fennec Edith finds is already the first part of "Anpu"'s soul. Genki Girl: Alma has all the markings, including trying to get Edith to do something and squeeing over rather baffled Anpu. Giant Flyer: The second ba is a giant bird-shaped tree which, in violation of physics and common sense, manages to take to the air. Give Me a Sword: As Edith gets ready for a final showdown with Turner, "Anpu" throws her a khopesh. God of Evil: "Anpu" — who is actually Set — is characterized by Heru as a violent, chaotic god seeking to destroy the order imposed by Ma'at. Given his attitude towards Edith and Alma, he is at least Affably Evil. Golem: The Blacksmiths in their true form bring this to mind. Glamour Failure: When Sobek gets emotional, his crocodile teeth show. Also, take a look at the reflection in the window here . Gotta Catch Them All: Edith's job is to collect all the ba. Groin Attack: When Turner tries to take "Anpu" from Edith, she — conveniently on the floor at the moment — kicks him where it hurts. His expression says it all, really. Hades Shaded: Set has crimson fur, and in his true form has dark red-tinted skin to emphasize his nature as an "evil" god of chaos and war. Heroic RRoD: What the Blacksmiths seem to try to push Edith into, picking fights with her all the time. How We Got Here: Chapter 2 begins the morning after Edith's run-in with "Anpu" as she wakes up, then cuts to the previous evening to deliver exposition. Humanity Ensues: Heru made this happen to Sobek so that he could take over as the city's mayor. In his true form, Set is massive both in terms of height and musculature, and in a dream-flashback scene (jokingly?) asks Edith if she finds his true form handsome. She is less-than amused. In the same dream-flashback, Ausir is shown accompanied by a leonine god — possibly Maahes — who's bulky enough to make Set look emaciated. Incredibly Obvious Tail: Blacksmiths are really unsubtle about following people. From pack behaviour and outright confrontation to impressively obvious cars and mugging your stuff to get info they could lift off the web, they all seem to have skipped Stealth 101. Instant Expert: Upon picking up the khopesh, Edith has the knowledge of how to use it instantly uploaded into her mind. In-Universe Nickname: Before learning his name, Edith calls Set "Bun-dog" and "Dog-Guy". "Anpu" often fails to notice that Edith may not appreciate him messing with her life and body for his own purposes. Heru is no better - he stops his Blacksmith from what may've been a killing blow on Edith because it would destroy a statue of him. Improvised Weapon: At one point of museum fight, both sides use heavy metal door against each other. I Shall Taunt You: When Turner attacks her with his handblade again, Edith mockingly calls him one-trick pony. He promptly changes the technique. I Surrender, Suckers: Edith pretends to give Anpu up to the second Blacksmith to lure him to a place where they can fight unbothered. Although it might be that she really does try to give him up, only for Anpu's ba to kick in and change the plan. Jerkass: Turner. He's furious with Edith for breaking the jar even though she's the one who dived for it and he's the one who wasn't looking where he's going in the first place. Jerk with a Heart of Gold: "Anpu" is impossibly self-absorbed, likes attention and lopes Edith into aiding him pretty much without asking, but he's definitely willing to put himself on the line when she's endangered. Just Here for Godzilla: In-universe; as the museum custodian is explaining Egyptian funeral rites, one of the kids can be seen murmuring "Where are the mummies?" Kiai: As she attacks Turner with her khopesh, Edith screams Haaaa! Lazy Bum: If Alma is to be believed, Edith has turned into one after leaving school. Leeroy Jenkins: Chen has all the markings of one. He loudly complains about his assignment being just about observation and in the end gets out of the car, deciding to go against the plan and get Edith himself. Let's Get Dangerous! : When Edith discovers that it won't be so easy for Turner to kill her now, she turns into full-blown Action Girl and takes the fight to him rather than evade him like she's been doing until then. Light 'em Up: When Anpu needs to get himself and Edith to safety, he summons a giant burst of light as a flashbang to cover his escape. Masquerading As the Unseen: Despite him rolling with Edith's assumption that he's Anpu/Anubis, Bun-Dog is actually Set, god of storms and chaos. The foreshadowing is strong with this one, but Edith doesn't realize this until Heru himself spells it out to her. Masquerade: It seems to be enforced either by magic or money - the police is seen waiting outside the museum until the fight between Edith and Turner finishes before entering. It's neither - one of Heru's supporters is the mayor, a position he was put in specifically for such situations. Mean Boss: Heru seems to be this - Turner alternates between trying not to upset him and asking him to please stop talking and let him do his work. As Turner throws Edith around, we cut to see that the Masquerade is stopping the police from entering the museum. At the beginning of chapter 2, we briefly cut to Oziris and Heru having a Cryptic Conversation in Duat before returning to Edith and Anpu. Medieval Morons: Defied. Edith tries to explain to Anpu what make-up and mirrors are, only for him to point out in annoyance that yes, they used both in Ancient Egypt. She then spooks him by turning on the tap at the bathroom sink. Metronomic Man Mashing: Edith first realizes that she now has Super Strength when she does it to Turner. Messy Hair: For all the powers Edith gets from Anpu, Wake Up Make Up is not among them. Even in his human form, Sobek's reflection is his deity form. When walking through the rain, Edith glances at her reflection to see its eyes are red and it's grinning at her. More Than Mind Control: "Anpu"'s ba seems to be manipulating Edith into sometimes more dangerous action to protect him. More Teeth than the Osmond Family: When Sobek's human guise slips, the first part of his deity form to manifest is a cheek-less maw lined with fangs. Mr. Exposition: Edith knows pretty much nothing about Egyptian mythology, so Anpu does all the explaining. Mugging the Monster: Chen goes after Edith. The consensus both in and out of universe is that she's not going to have much problem taking him down. He defeats her, but calls her a Worthy Opponent. Multiple-Tailed Beast: Bun-Dog has a forked tail. Neck Lift: Turner tries to get information out of Edith this way. Unfortunately for him, that's when she discovers her Super Strength. Never Smile at a Crocodile: The mayor of the city is revealed to be Sobek, the Egyptian crocodile god. He's an ally of Heru, but he turns out to be a Reasonable Authority Figure. Nigh-Invulnerability: After "Anpu" heals her, Edith is pretty much impossible to kill. Noodle Incident: Whatever happens to Turner when he's out of frame and cursing shall probably remain a mystery. No-Sell: Whatever it is the Blacksmiths are made of, the one Edith punches with full power of her Super Strength barely flinches and ends up with nothing more than a tiny dent where she hit him. Not So Stoic: Edith usually borders on Emotionless Girl, but she has her moments. The Oh, Crap! expression at hearing the jar break. Her war face when she goes Kiai at Turner. Tapping into Bun-Dog's power seems to have the affect of turning her into a Blood Knight when it's active. She's absolutely furious when she learns that Anpu placed part of his ba in her without her knowledge nor consent. Offscreen Crash: When Turner punches Edith from behind, the comic cuts to sound effect of "WAM!" and Anpu's exasperated expression. Off with His Head! : How the Blacksmiths deal with the tree-bird, by using a giant machete. Edith when she realizes that the canopic jar she has just saved is about to break after all. Alma looks freaked out when Anpu speaks to her, but she manages to remain surprisingly calm. When Edith realizes the Blacksmiths swiped her backpack after she forgot it at the scene of her fight with the tree-bird, she goes from shocked to livid. Parrot Pet Position: It seems that while "Anpu" won't let people pick him up, he's perfectly fine with travelling on their shoulders. Perpetual Frowner: Chen, the man Blacksmith who follows Edith, seems to have learnt to express only several different frowns. Perpetual Smiler: By contrast, the girl Blacksmith is always smiling, only in different ways depending on situation. Pieces of God: "Anpu" explains to Edith that the ba part of his soul was separated into nine pieces, which he tasks her with reuniting. Playing Possum: Edith pretends to have passed out so that Turner would stop pounding her into the walls. The moment he turns his attention to Anpu, she goes for the killing blow. Poor Communication Kills: Both Turner and second Blacksmith would probably fare much better if they bothered to explain Edith just why "Anpu" needs to be kept locked up. As it is, they insist on saying "he's no good for you", which, understandably, does little to help. P.O.V. Cam: We briefly see "Anpu" through Edith's eyes when she wakes up after Turner knocks her out. Power Glows: Anpu's power glows red. Punctuated! For! Emphasis! : "Why won't... you... break?" Punctuated Pounding: Turner is slamming Edith into walls while at the same time asking her whether she's still so sure about being able to survive him. Rags to Royalty: Inverted - "Anpu" went from having dozens of followers and a lot of money to being (comparatively) powerless and broke. Ramming Always Works: Subverted - Edith opes her fight with Chen by ramming a giant garbage container into him, but the Blacksmith having Super Strength, he shoves it aside with little problem. Reality Ensues: Anpu may want to send Edith on a quest, but she rightfully points out that she won't be able to search for anything if she doesn't go to work and get money for her groceries. Reasonable Authority Figure: Sobek. A short conversation with Anpu convinces him that the fennec is not going to help Edith properly, so he sets up an account for her, with promise of sending money to help her out, and tells her to come to him whenever she needs something. When Anpu and Turner talk in Egyptian, the former's eyes lit up in red. A moment later, he performs an impressive Light 'em Up. Edith's irises turn red whenever she uses her powers extensively. She gets this from Set, whose own irises turn red. Edith and her flatmate. Edith is The Stoic, while Alma is an emotional Genki Girl. Two Blacksmiths watching Edith. The girl's a Deadpan Snarker stuck to her phone, while the man's Hot-Blooded and impatient. Refusal of the Call: Edith doesn't want to go on a Fetch Quest for "Anpu," but Blacksmiths don't know that. Revenant Zombie: As the undead god of the underworld, Ausir — aka Osiris — looks like a shriveled husk. When he was alive he was much more handsome. Royal Brat: "Anpu" believes Heru (Horus) to be this, claiming that no-one ever stood up to him. The Blacksmiths are unflinchingly loyal to him, he locked his own brother in a jar for two thousand years and is willing to kill Edith to get what he wants, while, at the same time, not willing to destroy a statue of himself for the same purpose. "Anpu": Heru is a classic example of too much power at too young an age. Running Gag: Edith likes to mock Chen's name, Chen. Run or Die: First part of first Edith vs Turner confrontation is this for Edith, as the Blacksmith is way out of her league. Schadenfreude: In-universe, the girl Blacksmith is just waiting to see Edith wipe the pavement with her overeager colleague, Chen. Say It with Hearts: When Alma sees "Anpu," her speech bubbles get a whole lot more heart-ey. Sealed Good in a Can: A bit more literal example than most, as Anpu is sealed in a jar. His family seems to consider him a Sealed Evil in a Can, though, and if Epileptic Trees running wild among the fans are correct, they may just as well be right. Shapeshifting: The Blacksmiths can shapeshift their limbs into things like blades and hammers. Sharp-Dressed Man: This seems to be the dress code for all Blacksmiths, as the three we've seen so far are certainly very well-dressed. Sibling Rivalry: One of the hiatus-filling strips suggests that this is what's going on between Anpu and Heru. Silent Snarker: Before he reveals that he can speak, Anpu can already express quite clearly what he thinks of Edith's first attempt at badassery. Slasher Smile: At the end of Chapter 2, Sobek flashes a literally predatory smile courtesy of his More Teeth than the Osmond Family at the thought of things getting more interesting. Sobek: You don't know me. Sobek: I'm not your friend. "Anpu": You've never looked so unhappy. Super Strength: Apparently a generic divine gift, as both Edith and Turner have it. After something with lightning happens to Turner, he curses this way. Edith does the same when the second Blacksmith asks what her blade's made of. Talking Is a Free Action: After she punches Turner, Edith takes her time to turn away from him and comment on his No-Sell. Subverted, as he uses this time to sneak up on her. Talk to the Fist: When Edith tries to tell Turner that she doesn't have Anpu with her, she doesn't manage to finish before he slams her into a wall with his blade-hand. Turner states that the jar is stronger than it looks and won't break. Of course, it's barely seconds before he collides with Edith and discovers that the jar is more fragile than he thought. Just a page later, Edith does almost the same thing. The Charmer: The moment Anpu realizes that staying on Alma's good side will force Edith to keep him, he starts to pretend he's an adorable puppy, instantly winning Alma over. The Faceless: Turner's boss (likely Heru) has his face always hidden either by panel borders or shadow. The Stoic: Edith takes everything that happens to her pretty much in stride, barely ever showing any strong emotions. Thinking Up Portals: Even in his underpowered state, Anpu can teleport himself and Edith over short distances. Three-Point Landing: After freeing herself from Turner's blade, Edith lands this way. Doubles as her Let's Get Dangerous! moment. Unfamiliar Ceiling: After being knocked out by Turner, Edith's surprised to see museum library's ceiling over her head when she wakes up. The Un-Reveal: Anyone with a degree of familiarity with Egyptian mythology (which Edith lacks and is called out on by Sobek and Heru) can tell the crimson fennec-like creature with the forked tail isn't Anpu/Anubis — who's traditionally depicted as a black jackal — but Set. Van in Black: The two Blacksmiths following Edith drive what someone called "the least unobtrusive van in history". She doesn't notice them, though. [Verb] This! : Suit Guy gives Edith "heal from that!" Viewers Are Geniuses: Most people know that Set is a God of Evil, and some may recall that before his Flanderization into chaos personified, he was Ra's trusted lieutenant. But how many readers would know that he's also a god of storms, which is how the Blacksmiths refer to "Anpu"? Voice with an Internet Connection: Heru seems to be this for his Blacksmiths. What an Idiot! : invoked The girl Blacksmith says this word by word when talking about Turner. Chen, her co-worker clearly agrees, noting that the "errand boy" was sent only because the jar was supposed to be unbreakable. Why Won't You Die? : Turner says this almost word by word when Edith's Nigh-Invulnerability is discovered. Worthy Opponent: When Edith almost cuts the Eye of Horus on his neck, Chen remarks that he'd like to see how she fights with a bit of training. You Can Talk? : Edith expresses this with her expression alone when Anpu speaks up, having been silent for entirety of museum fight. You Shall Not Pass! : When Edith realizes that the Blacksmith isn't playing around, she tries to hold the line while telling Anpu to run for it. Subverted when she realizes that Turner can shapeshift and instead choses to follow Anpu in their escape.